These days there are so many campaigns going on that are meant for us, to promote and help one another: bullying, hunger, self-image, suicide, acceptance, abuse, disease, and the list goes on and on. It is simple for us to join these campaigns on social media sites, we just change our profile pictures, ‘like’ pages, share ad-slogans, etc. But what are we really doing to help and make a difference? Praying? Begging God to help? Most of us can’t go out and speak at functions, travel across the world to feed the hungry, donate a bunch of money to causes, or treat the sick. But what we can do is reach out to the people around us and be the type of person that people need & depend upon (even in small ways). The type of person who makes a difference (big or small) in the lives of every single person around us. We can never know the difference a simple smile or a kind word can make in someone’s day. I have heard a few stories where people were in desperate situations contemplating suicide and because a stranger smiled and asked how they were they didn’t go through with it. I cannot tell you the amount of times that I have been to a church or a ‘religions/Christian’ function where I was made to feel like a pariah. The members of the church or function had already developed their little cliques and groups. Honestly, many of the people there seemed like the most unfriendly and unwelcoming people I had ever came across. We, as Christians, claim that we want to show everyone the grace of God, lend a helping hand, love everyone equally, and welcome with open arms. But how often do we actually act upon those things? When was the last time that we went out of our way to speak to a complete stranger just to see how they were doing? Stepped out of our comfort zone to help someone else? This parable is a beautiful example of a kind hearted and compassionate person helping a fellow man. However, the fact that the man needed help was very obvious, and sometimes the ones that need the most help are not entirely apparent. That is why it is so important that we constantly show love, kindness, and compassion to everyone around us. Just Remember, the smallest of actions that take little to no effort can make the biggest of differences in the lives of others! That is living a Christ-like life!!!! So get out and Do Something!!! In Time is a movie that unsettled me. I mean seriously unsettled me. Why? Find out by visiting His Yes Girls blog where you will find my summertime guest post. Perfect love: A book review about "Audrey Bunny"
Audrey Bunny is a children’s book written by Angie Smith with illustrations by Breezy Brookshire. The text of the book is neatly organized into clusters of three to four sentences per page with the exception of one or two sentences on pages where the illustrations take center stage. Smith weaves a beautiful tale filled with vivid imagery of a stuffed toy bunny and a written message that portrays perfect love. Smith uses two key questions on page 5 of the book that are a page turner: “What happened to bunnies that were never chosen? Did they live in the barrel forever?” Instantly the reader wants to know what happens to the bunny in the barrel, these questions prompt the reader to turn the page. The illustrations by Brookshire are breathtakingly beautiful and capture the whimsical feel of the tale weaved by Smith. The front cover has a beautiful sketch of what looks like a cherry blossom tree in full bloom. The deep rose-pink petals cascade from the tree’s brown limbs, showering a young girl with carrot red hair who is holding up a bunny in mid-air and apparently twirling in delight. The sway of the girl’s flowing white dress and arrangement of her green sweater give the reader the impression that it is a slightly windy day. The cover picture serves as foreshadowing as to how the story will unfold: Girl finds a stuffed animal bunny, presumably at a toy store. Girl’s parent buys the bunny. Girl falls in love with her new toy and treats it like her very own best friend. As the book is opened, the reader discovers in the first few pages in which the setting is a toy store, that the young girl’s name is Caroline. As the story progresses, the reader learns that Caroline names the bunny Audrey which was her grandmother’s name. 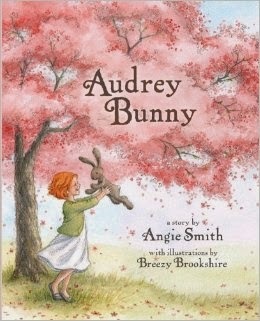 The sketches by Brookshire are essential to the journey between Audrey and her bunny. Every page of the book tells the reader something about the bunny’s plight to be loved despite an unsightly mark on her chest, and the young girl’s desire to find a new toy to love. 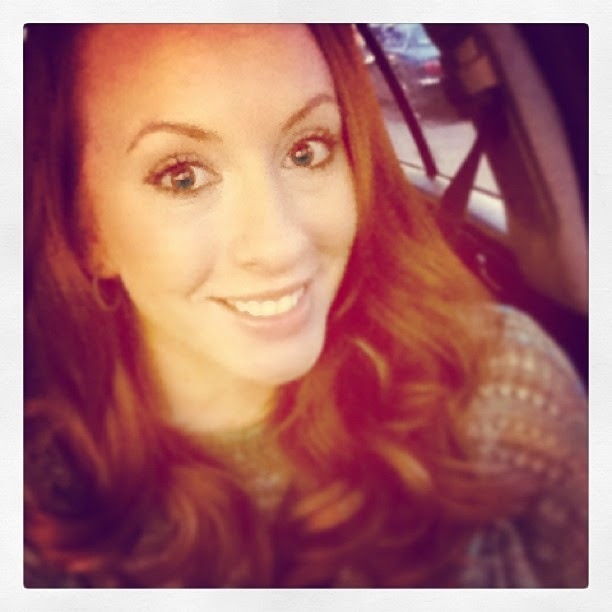 Children can relate to Caroline and appreciate her happy spirit and sweet personality. They most definitely will understand Caroline’s eagerness to include the bunny in her everyday activities—from tea time and dress-up to reading books and falling asleep. Children will make a text-to-self connection when Caroline showcases Audrey Bunny to all of her friends at school for show and tell. The entire book is incredibly relatable for children—especially young girls—in their early years of education. Parents, especially mothers, will love this book and may want to use it as the traditional bedtime story as they lull their daughters to sleep. Unconditional love is the theme of this story. The girl loves her bunny despite its imperfection. Perhaps Smith meant this story to be a portrayal of how God loves us perfectly, as imperfect as we as humans are. Maybe the message at the heart of this story shows us how God’s love is unfailing as He looks past our broken, brings out our beautiful and restores us completely. We may still have our imperfections such as Audrey Bunny’s mark which can be used as a metaphor in the real world, but we have the perfect love and providence of a Savior. I would recommend this book to every parent who wants to show their child—especially ones who feel that they do not fit in or are not good enough—that they are loved not just by their parents and family members but by the Creator of the Universe whose love is pure, perfect and unconditional.